Use this card! Jonathan Stark has offered up his Starbucks Mobile app on the Web for others to use. "Flattered" Starbucks calls project "really interesting"
(CNN) -- Need a caffeine boost? Use Jonathan's card. Want to buy a cup of joe for a pal? Or, more likely, someone you've never met? Use Jonathan's card. Jonathan Stark, a mobile app consultant from Providence, Rhode Island, had a crazy idea. What if he gave the entire Internet access to his Starbucks mobile-app code and invited them to have a free cup of coffee on him? And, of course, if they wanted to throw in a few bucks for the next guy or gal, that would be OK, too. Jonathan's Card is a social experiment that Stark launched in mid-July, although the project didn't really gain traction until it got the notice of several tech blogs over the weekend. As of Monday afternoon, he said, $3,651 had been spent on the card, which he started with a $30 balance. At least 177 people had donated money to it, he said. "It's been a bit emotional, actually," Stark said Monday. "People's reactions have ranged from accusing me of stealing to thanking me for renewing their faith in humanity. "It's been very uplifting overall, but it does hurt when the occasional pessimists -- someone games the system or sends negativity my way." For its part, the company seems just as interested as Stark in seeing how things will work out. "We think Jonathan's project is really interesting and are flattered he chose Starbucks for his social experiment," said Gina Woods, director of executive communications for Starbucks, in an e-mail. "We're curious to see how his project continues to evolve." 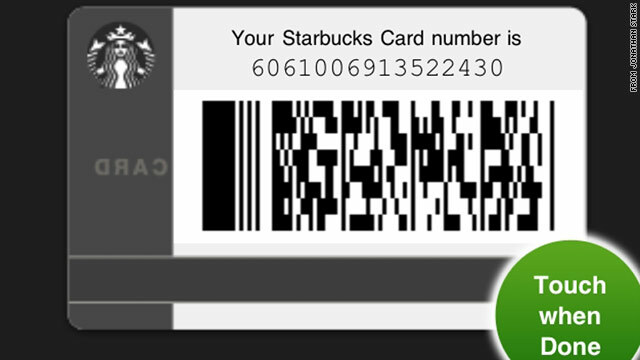 Stark simply posted an image of the electronic card from his Starbucks mobile app, inviting people to copy it to their own phones. "Jonathan's Card is an experiment in social sharing of physical goods using digital currency on mobile phones ...," he wrote on his site. "Based on the similarity to the 'take a penny, leave a penny' trays at convenience stores in the US, I've adopted a similar 'get a coffee, give a coffee' terminology for Jonathan's Card." He's been mostly impressed with how users have behaved. A couple of times, after big donations, a few karmically challenged users may have transferred money to their own Starbucks accounts, he said. But, as the balance has gone up and down -- sometimes plummeting from $100 to zero and back again in a matter of minutes -- most everyone has taken a little and given a little, he said. "The vast majority of people are being cool, which is the main takeaway." One wrinkle he didn't expect? Coupons for free coffee, which the company rewards for frequent use of the mobile app, come in the form of physical coupons and aren't applied to the e-card. Stark says he hopes to figure out a way to distribute them or, worst case, probably won't use them. Stark has set up a Twitter feed for the card, scraping data to give real-time updates on its balance. It was fluctuating quickly Monday afternoon, with updates coming virtually minute-by-minute as the balance bottomed out and then got replenished. (An effort to use Stark's card at Starbucks' CNN Center location in Atlanta, happened at one of those bottomed-out moments, unfortunately). Fellow Twitter users seemed high on the experiment. "Had something very good happen for me (it's been awhile). Put $10 on @jonathanscard to pay it forward. What a great social experiment!" one user wrote. "Dear Mr. Stark: I've had a hard time believing in human goodness. Thank you for demonstrating otherwise," another posted, along with a photo of a "cake pop" presumably bought with the card.